It has now been one month since Autodesk University 2017. I am now sufficiently rested, I am all caught up on the work I missed, and I can honestly say that I loved yet another experience teaching a great group of eager students. I thought that with this blog post I would answer a fantastic question that I got at the end of my class. For those of you that didn’t make it to Las Vegas, Autodesk has now posted all the classes that were recorded. For my specific class, Assemblies: Putting It Together in Fusion 360 you can click here to view it. Question: Why when I use the Distributed Design method of multi-component design in Fusion 360 can’t I create a Joint Origin in my design? Answer: With the Distributed Design method of multi-component design you are inserting previously designed components into a top-level design. The components used in the top-level multi-component design were created in other design files and all of their design information is stored in that file. In the top-level design the inserted component is read-only. You cannot add a Joint origin at this level. You must open the single design on its own and add the joint origin there. Once added it will be available for use in the multi-component design. For my student, he wasn’t interested in selecting the two placement references in the same design. He wanted to create a joint origin between two components that had been inserted into the multi-component design, similar to that shown below. Unfortunately, because the references that would be picked are stored at a lower level, this cannot be done. To constrain this component, I had to determine the midpoint distance value between the two brackets and use an offset value equal to that value to properly position the axle. For Inventor users, this is possible which is likely why he was struggling with doing this and expected it to work. To expand on this a little further, consider other ways of creating multi-component designs. For designs that use a file directly from the McMaster-Carr Content Library, joint origins can be created in the top-level assembly because the component is stored in the top-level assembly and you have write access. Using the multi-body design method, joint origins can be created in the top-level assembly because the components were created in the context of the top-level design and you have write access to each component. Additionally, you can select references that exist on different components. I hope that this helps explain! There are a lot of fantastic classes now live on AU Online, if you wanted to simply search the classes that Autodesk has posted, click here . Enjoy! For Autodesk Users, it's the Most Wonderful Time of the Year! Yes, we’re talking about Autodesk University, #AU2017, which is the not-to-be-missed event for Autodesk users happening next month at the Venetian Resort in Las Vegas. ASCENT will be there with a booth and two of our instructional designers who are teaching a couple of not-to-be-missed classes! Take a class from Fusion author, Jennifer MacMillan, or chat with her about the latest Fusion Video-Enhanced eBook we’re about to release: Fusion 360 Introduction to Sculpting with T-Spline Surfaces. Or join Michelle Rasmussen, Civil 3D and Infraworks expert as she leads her class at AU. Michelle is an AU veteran and is also serving as an AU mentor and lab assistant this year. Both presenters have put together short videos to introduce their AU sessions. See below for class details and register now to reserve your spot! When these ladies aren’t teaching classes at AU, you can find them at the ASCENT booth (D314), ready to discuss their latest courseware titles. And speaking of courseware...it wouldn’t be AU without a book sale from ASCENT! This year, however, instead of selling books in the Exhibit Hall, we're hosting a pre-AU promo where you can save 25% off ASCENT’s printed training guides and get free shipping to Autodesk University! This offer is only valid until the end of the day on October 25th (in order to give us time to print your books and ship them to AU for you), so if you are heading to AU, now is the time to place your order. We’ve set up a special AU pre-show eStore that already has reduced book prices and shipping set for AU. Just place your order and come to the ASCENT booth during regular Exhibit Hall hours at AU for book pick-up. If you’re heading to AU, we look forward to seeing you there! Solid geometry features that are created after the first solid feature are often referred to as secondary features. They can be created from sketches as extruded and revolved features, or as features with implied shapes (e.e., holes and fillets). As an alternative to selecting an Origin Plane as the sketched plane, you can also select planar faces of existing features. Existing geometry can be used as constraint and dimension references. Additionally, as you reference design edges while sketching (i.e., dimensioning or offsetting), these edges or vertices are automatically projected into the current sketch. When the sketch plane is located in or behind other geometry, you can temporarily remove the portion of the design that is in front of the sketch using the Sketch Palette's Slice option, as shown below. This is a short excerpt from the Autodesk Fusion 360: Introduction to Parametric Modeling student guide, by ASCENT - Center for Technical Knowledge, an Autodesk Authorized Publisher. For more information, visit http://www.ASCENTed.com. Once a base feature exists in a design, additional geometry is created by referencing it. The following sketching tools enable you to create new entities based on existing geometry. Incorporating the use of projected geometry into a sketch enables you to build relationships between features. In the example below, the edges of the hole were projected onto a sketch on the front face. The sketch was completed by adding lines between the points and the sketch was extruded as shown on the right. The projected edges create a relationship between the hole and the extrusion so that if the diameter of the hole changes, the height of the extrusion changes accordingly. To make a design easier to work with, its display can be customized by changing its visual style. These options are located in the Display Settings menu at the bottom of the interface. The Visual Style settings are an application setting and are not saved with the design file. Examples of the display styles that can be used are shown below. The process of creating multiple bodies in the context of a single design file is known as multi-body design. This is one of the methods available in Autodesk Fusion 360 to create a product that is comprised of multiple assembled models. 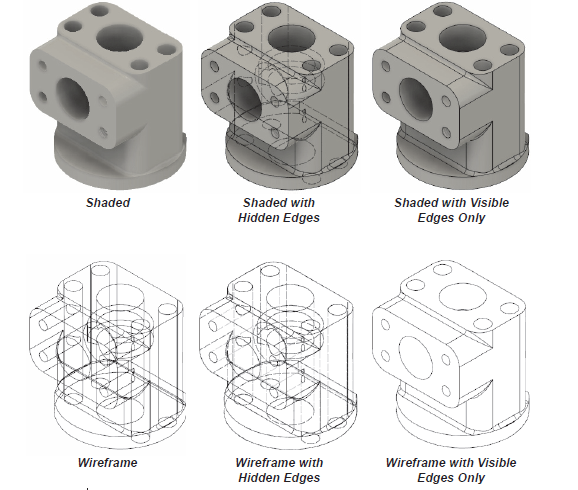 This design approach enables you to create all or some of your assembled design as separate bodies within one design file. The bodies are then converted to components while still remaining within the one design file. 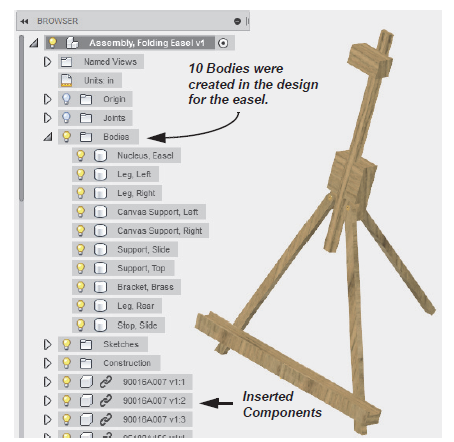 All design files contain a Bodies folder in the Browser. This folder lists all of the bodies in the design. The design shown in the example below is a folding easel. It was designed using a combination of the multi-body and distributed design methods. All of the wooden components in the easel were created in the context of the single design using bodies, and all of the hardware were inserted. Joints can be added to assign the required degrees of freedom that enable the easel to collapse and expand. The Item in Autodesk Vault Professional is the object that is created and associated to each Inventor part or assembly (as well as other non-CAD document design files) and makes up the Bill of Materials (BOM). Every Item has a Bill of Materials as shown in the Bill of Materials tab (BOM View) of each item. After double-clicking an item in the Item Master, click Edit to make changes, then click Save to save the changes. Note: To edit a BOM, the structure view must be set to Multi-level. Manage your BOM's rows by performing the actions shown in the below image for adding, deleting, and reordering rows. You can also toggle rows on and off for export purposes by clicking the light bulb icon. To make changes such as quantity changes, click in the cell for the desired row and enter the new value. There are many ways to share and export your BOM data. Three commands for sharing BOM information are shown below showing differences between commands. Additional details are covered in Chapter 9, "Items and Bill of Materials Management" of the Autodesk Vault Professional 2018 Data Management for Autodesk Inventor Users student guide and in the ASCENT Webcast: Working with Bill of Materials in Autodesk Vault Professional (has a short quiz at the end!). Question 1: What is the use of turn on/off a row? When using the BOM Export command, only rows turned on are exported. Therefore, this gives you flexibility when sharing the BOM data for downstream purposes such as sharing with suppliers and integrating with other business systems. Question 2: What is the difference between a Row Number and Position Number? The Row Number or Row Order refers to row ordering in the BOM View. The Position Number can be thought of as the number that shows in the balloon and Parts list on the drawing. Question 3: Can the BOM comparison be exported? You can export the BOM Compare report by selecting File > Print Preview then File > Export Document. The output formats to choose from are shown in the image below.